It feels only right to share such a beautiful spring salad on the first day of spring. 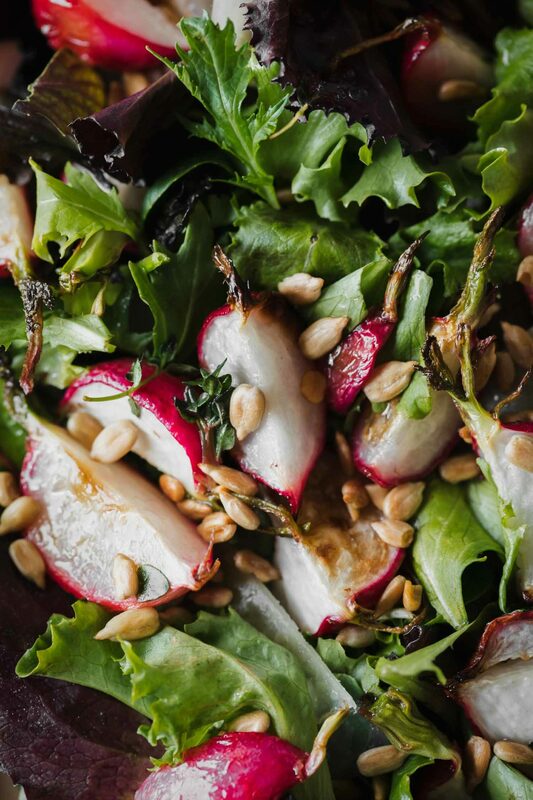 This roasted radish salad may seem simple in flavors but everything comes together in the best way possible. I made this salad for two but ended up eating most of it myself. And if you’ve never roasted a radish, you’re in for a treat. The bite of the radish melts away while the essence of the radish stays. Add to that a delicious butter dressing and it’s my idea of a perfect spring lunch. A wonderful spring salad that features the easy roasted radish tossed with a savory butter dressing. Perfect as a lunch or dinner side. Heat oven to 425˚F. Trim radish ends, leaving about one inch of greens on top. Quarter each radish and toss with olive oil and salt. Place in a roasting pan and roast until browning and tender; 15 to 20 minutes. When the radish are just about done, melt the butter in a small skillet. Remove from heat and add the lemon juice, salt, and thyme. Remove the radish from the oven and add the butter to the pan, tossing to coat the radish. Assemble the salad with the torn butter lettuce, toasted sunflower seeds, and shaved parmesan. Add the radish and butter from the pan to the salad. Toss to combine and serve. Tips + Tricks: I use a large amount of sunflower seeds on salads and grain bowls. Toast 1 cup or so and keep them in an airtight container for a week or so. Grains: I probably get repetitive here but cooked grains are the easiest way to add a bit of bulk to a salad. I love a good lunch salad but I dislike the feeling of hunger an hour later. Add 1/2 cup or so of grains per serving- farro, einkorn, and sorghum are house favorites. Nuts: Swap out the sunflower seeds for toasted hazelnut nuts or pine nuts. Vegan: The butter dressing is really solid with the radish but to make this vegan, I recommend leaving off the cheese and swapping the butter for a hazelnut oil.